The newly established African Governance Architecture (AGA) is yet another African Union (AU) initiative that is bound to face serious challenges on the continent. Between 15 and 17 March 2011, a technical meeting was held in Banjul, the Gambia, in order to strategise on how best to operationalise the AGA. It must be recalled that since the establishment of the AU in 2002, there have been a considerable number of governance instruments established under its auspices and institutions to implement them. What has been lacking, however, is the coordination of these institutions together with others in order to create an integrated approach to governance. The most recent popular uprisings in North Africa (Algeria, Egypt and Libya); in the Horn of Africa (Uganda); and in Southern Africa (Swaziland and Malawi), are serious indictments to the effectiveness of the AU whose objective is to promote democratic principles and institutions, popular participation and good governance, among other things. The establishment of an integrated approach to governance in Africa could not have been better timed. Established under the leadership of the AU Commission, which is the Secretariat of the AU, based in Addis Ababa, Ethiopia, the AGA is the overall political and institutional framework for the promotion of democracy, governance and human rights in Africa. In the main, the AGA is aimed at strengthening coordination among the AU organs and other institutions mandated to promote democracy, governance, and human rights as a measure of enhancing their capacity and optimise their impact. These organs and institutions operate at the international, regional, sub-regional and local levels. The first challenge that the AGA will face is the use of the concept ‘governance’, which cannot be equated to the concept of ‘good governance’. The Constitutive Act of the AU only makes reference to ‘good governance’ and not ‘governance’. The conspicuous absence of the fundamental concept of good governance, which is entrenched in the Constitutive Act, will render the AGA ineffective since ‘governance’ as a concept does not necessarily advance the objective of the AU of promoting good governance. Good governance, and not just governance, is what Africa requires. Any framework aimed at promoting the universal principle of good governance should, therefore, be named accordingly. The second challenge that the AGA is bound to face is that the AU Commission, which is at the epicentre of the AGA, is not well organised to spearhead this initiative. The AU Audit Review of the High Level Panel of the Audit of the African Union of 18 December 2007, revealed that the relationship between the Chairperson, Deputy and the Commissioners of the AU Commission could at best be described as ‘dysfunctional with overlapping portfolios, unclear authority and responsibility lines and expectations’. To date, no reports have revealed the opposite to this unflattering description. The third challenge that the AGA will face is that, as a framework for facilitating harmonisation of instruments and coordination of initiatives in democracy, good governance and human rights, the institutions with formal mandates on governance in Africa, such as the AU Commission, African Court on Human and Peoples’ Rights, African Commission on Human and Peoples’ Rights, Pan-African Parliament, African Peer Review Mechanism, AU Peace and Security, to name but a few, are fragmented, diverse and spread through out the continent. This is complicated by the fact that the Regional Economic Communities (RECs), which are also part of this framework, have distinct mandates with diverse and sometimes multiple membership. 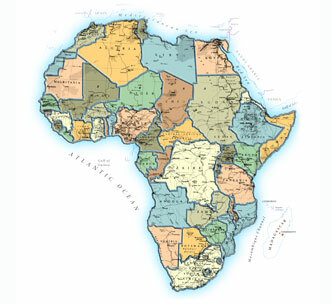 The third challenge facing the AGA is that its operational arm, otherwise known as the African Platform on Governance, which consists of the relevant AU organs and the RECs, has thus far not succeeded in effectively integrating the continent, economically, politically and socially. It will also face serious and complex challenges from the AU Member States, the majority of whom do not subscribe to the principles of democracy, good governance and respect for human rights. The AU Member States have also fiercely resisted the International Criminal Court (ICC) processes of bringing African leaders to account for alleged serious violations of human rights, such as war crimes, genocide and crimes against humanity. The case of the ICC processes against Sudan’s President Omar Al Bashir and Libya`s `Brother Leader`, MuammarGaddafi, furnishes a good example in this regard. The fourth challenge facing the AGA is that out of the 53 AU Member States, only 8 have ratified the African Charter on Democracy, Elections and Governance, adopted on 30 January 2007, which is considered to be the most important instrument for the effective operation of the AGA. Chapter 5 of this Charter contains specific obligation of States in the development of necessary legislative and policy frameworks to establish and strengthen a culture of democracy and peace. The final challenge facing the AGA is the establishment of a sustainable funding scheme that will ensure the effective functioning of the AGA. That the AU Member States generally default in paying their subscriptions regularly (if at all) is a known fact. The sustainability of the AGA requires a funding formula, which will ensure that the AGA does not only depend from the AU Member States’ subscriptions. For the integrated approach to good governance to thrive, AU Member States must address all these challenges guided by the main document that bind them, which is the Constitutive Act. One of the reasons for the establishment of the AU was that the Member States were ‘determined to promote and protect human and peoples’ rights, consolidate democratic institutions and culture, and ensure good governance and the rule of law’. The AU Member States’ support of the AGA cannot be overemphasised as the operationalisation of the AGA presents an important opportunity for transforming the continent for the better.